Sandra Phillips-Posner's first book, Smart Shopping Montreal , quickly climbed onto the best seller list and remained there (with its annually updated editions) for the past 21 years. Having spent some calm years as an art teacher (with a Masters degree in Art and Education from Queens College/CUNY), Sandra's life took an interesting turn following this success. This native New Yorker was offered her own column, which has run for 17 years in Montreal 's newspaper The Gazette . She has also become a regular on the noon news, talk radio and TV talk shows, and has gained popularity as a lecturer. Stan Posner is actually an actuary who fell in love with both Sandra and computers. He has owned a computer consulting business since 1984 and has done work with such companies as Raytheon, Honda, Bombardier and Atomic Energy of Canada. He has also spent many years teaching actuarial math at Concordia University, after having graduated with Honors in Math from McGill University. Stan is the computer guru for their Travelsmart publishing company. 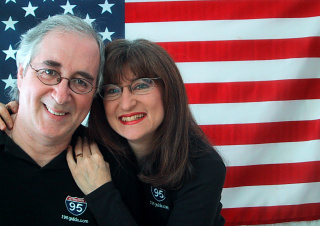 Sandra and Stan's passion for learning and travel has taken them to 17 countries, 43 U.S. states and 9 Canadian provinces. During and after their adventures, they report for travel radio, e-zines and print media. This book is the perfect combination of Stan's love of maps and his computer expertise together with Sandra's delightful insightful blurbs. After 28 years of marriage, and even after spending 10 hours a day for 8 weeks in the car together doing the research for this book, they are still crazy about each other. They have a way of making travel both informative and fun.